Throughout this interview with the director of the EEB1, Mr. Goggins, we explored both a combination of intimate topics and school issues. Music is important to him, it seems. We ask him about his hobbies and what he does to unwind, and although he enjoys autobiographical and historical literature as well as the crime genre, music keeps resurfacing in the conversation. He has a very eclectic music taste; he’ll listen to almost anything and plays the piano himself. “I love this job,” he says without hesitation when asked how he likes it. “I like it a lot.” We learn that he comes from a teaching background; he’s done some teaching of music in past schools, although his qualifications mainly lie in STEM subjects: he studied maths, statistics, biology, chemistry and biochemistry at University College Dublin. “But music was something that I followed outside of school through exams,” he adds. What motivates our director is thinking that he is doing everything necessary for us to complete a fulfilled and enriching experience, which should be a very powerful tool. Mr. Goggins tries to look at where we are and see where we should go from there: if there is something wrong we should try to improve it, and if not we should try to push further and see how much better it could get. Our director wants to make sure that our environment is the most advantageous it can be for us and to support us so that we can make the best of the opportunities afforded us. We should be exposed to favourable opportunities which will guide us along a certain path, such as being involved in clubs like MEC or even EURSC MAG and choir. Exploring different approaches to education should be improving not only our academic skills but also our social skills. His goal is to prepare us for higher education, to have our ultimate destination in mind to furthermore help us get there, and to understand that getting into a university is not the end goal. Mr. Goggin’s daily routine is hectic – his day is filled with surprises both good and bad and often turns out to be very exciting: “The wonderful thing about [the job of director] is that no one day is the same, absolutely no day.” We could see that his passion and enthusiasm for his job was completely overflowing. His day consists of reading a lot of emails from students, teachers and parents. He oversees financial responsibilities, such as signing papers confirming orders and big shipments that we are paying for which vary depending on the day. Mr Goggins is very involved in the social upkeep of the school and will be meeting up very often with students and teachers throughout the day to feel more connected and in touch with who is he is dealing with in his job. In all of his work, he tries to see where it is that he should be putting in his energy and focus in order to work more efficiently. Mr. Goggins is in full support and admiration of the school system and believes the school system here is a very special one which tries to combine different educational and cultural ideologies to better the unification of this community; creating a very unique combination of values and beliefs. To improve the school system, Mr. Goggins focuses on making our school experience better. A lot of improvements of the school system are already on the way such as the math syllabus, especially concerning maths 3, where they are trying to better the Baccalaureate passing levels up to 90-95%. The director and administration are also hoping to better harmonise the curriculum between the different sections in the school, as the student experience and teaching currently is not the same throughout. The director is also currently working on the adaptation to the new grading scheme which is currently applied from S1 through S5 and how this will follow through into S6 and S7. “We are working towards competence-based results rather than knowledge-based results,” he says. “We want something else other than have you learned everything off by heart and can you write it back down again”. Mr. Goggins explained to us that we work in a system which follows the European principles: a system where we have a democratic view on taking decisions meaning that when something is put in place, it must be run past the students, parents and teachers. The director stressed the importance of being able to come to a decision which benefits everybody, through compromise. At the end of the day, this system combines all our ideas to create an agreement from the whole community of the school. To our director, European values mean that “we are all different – we come in different sizes, shapes, colours, religions, genders…” and the European experience is created by the ability to accept one another for who they are, and by this, obtain an ability to work together more efficiently. As we do so, we learn to respect our environments through the understanding of where each and every one of us come from, and these values will persist throughout our lives and make our European community united. “I find ways that we can move through together, through communication and compromise.” Mr. Goggins insists that keeping an open mind is the key to good functioning. The director tells us he would like to have a proper conversation with students to find out what they think is good about the school and what they think can be worked on: he argues that some of the best ideas and ways to work forward will come from the students themselves. He would like to stress the importance of work necessary for students going onto the next level: “It’s more than just about grades and getting into x university, you need to look beyond that and see where you could go from there.” University shouldn’t be our finish-line when we look at what we want to achieve. Throughout the interview he impacted us on both a professional and personal level, fully representing the European school image. We finish our interview by thanking Mr. Goggins, and we get up to take some photos of him. 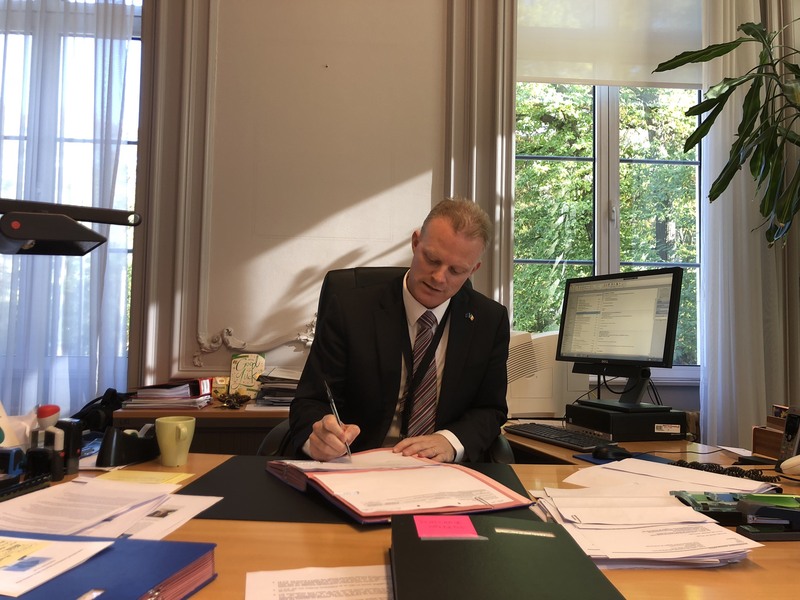 “Isn’t that a bit fake?” he laughs when I suggest we take a photo of him appearing as though he is signing some papers at his desk. It is clear to us that he insists on transparency towards the pupils of this school and tries to avoid misconceptions in order to be true to one another. Really interesting interview, well done girls!